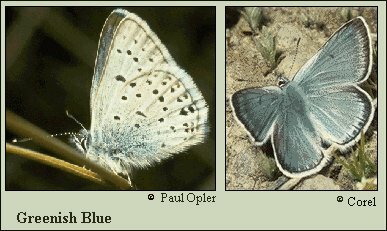 Identification: Upperside of male iridescent green-blue; females brown with blue at wing bases. Underside is pale gray with green at wing bases and rows of irregular black spots. Life history: Males patrol near the host plants, close to the ground. Eggs are laid in flower buds of clover; caterpillars eat the developing flowers. Half-grown caterpillars hibernate, then resume feeding and development the following year. Flight: One flight from May-July. Caterpillar hosts: Flowers of various clovers, especially alsike (Trifolium hybridum). Adult food: Nectar from flowers including clovers (Trifolium species). Habitat: Bogs, roadsides, stream edges, open fields, meadows, open forests. Range: Boreal western North America from central Alaska south along mountains to southern California and southwestern New Mexico; east across southern Canada and northern Great Lakes area to Maine. Conservation: The San Gabriel Blue, an undescribed subspecies, is extinct. It lived in wet meadows of the Big Pine Recreation Area in the San Gabriel mountains of southern California until the U. S. Forest Service drained the meadows. Excluding the San Gabriel Blue, the species has The Nature Conservancy Global Rank of G5 - Demonstrably secure globally, though it may be quite rare in parts of its range, especially at the periphery. Management needs: Restore meadow habitat in Big Pine Recreation Area.